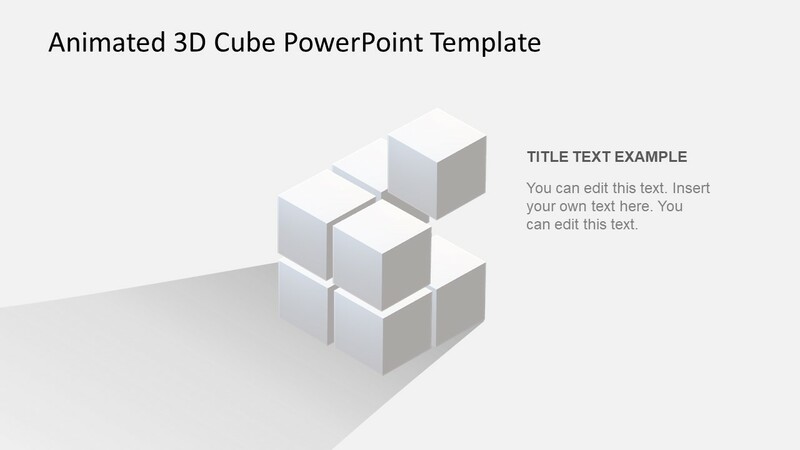 The Animated 3D Cube PowerPoint Template is a segmented block presentation. It shows 8 cubes as 3D objects of PowerPoint in several layout designs. 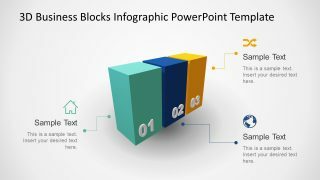 Further, these layouts are well-structured block shapes to demonstrate business and other relevant topics. Such as a system comprising of individual units or assembly of parts which complete the product. 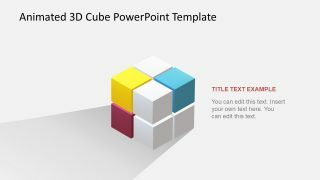 There are 9 slides of 3D cube designs with the transition of layouts to animate this presentation. 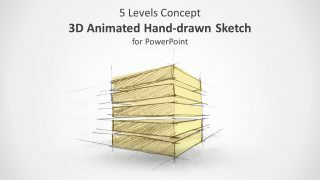 Although these slides have an organized format of transition for one design to another. 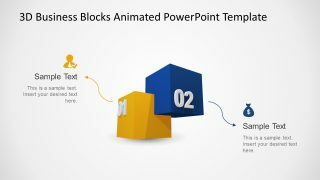 The users can copy their desired layout for their existing presentation. 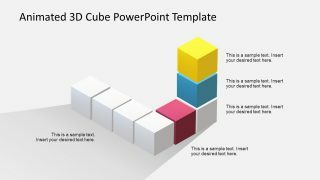 The Animated 3D Cube PowerPoint Template is a slide deck of high-resolution graphics. The cube units editable in size, shapes, rotations. However, color and additional shape effects could be customized in applications like 3D Paint. 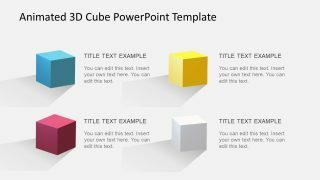 Moreover, this template contains three color shapes which users can duplicate for their presentations, adjust and apply animations. 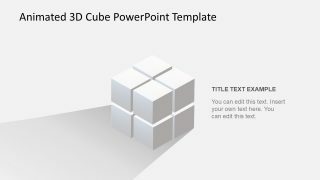 The use of 3D cubes PowerPoint enables presenters to rotate the objects in any position according to presentation needs. 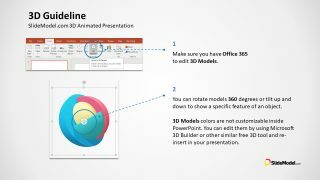 Further PowerPoint offers special animations for 3D objects like arrive, jump & turn etc. 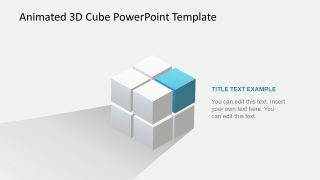 The first slide shows all eight cubes join into one large cube. 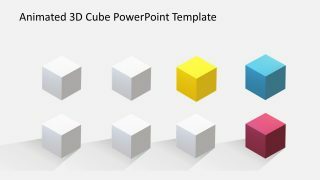 And four additional templates show the same design using colorful cubes. On the other hand, two layouts show horizontal placement of cubes. Whereas, the last two templates are, a bullet list and diagram format. 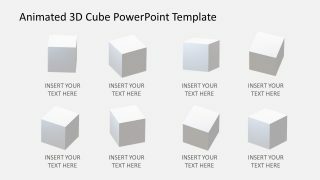 The ideal use of this PowerPoint is a company project where each cube displays different elements of meeting agenda. The systematic distribution of topics in 8 cubes enables viewers to keep track of discussion. 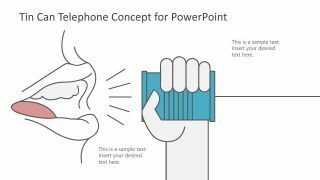 While these visual graphics and animations enable an audience to listen attentively. Furthermore, use cube layouts to present strategies, plans, and advertisements.